The College Foundation of North Carolina (CFNC) is sponsored by the North Carolina State Education Assistance Authority (NCSEAA) and Pathways of North Carolina. The website provides a detailed planning guide for college by grade with relevant links such as links to test prep resources and college matching assistant. The matching assistant is limited to North Carolina colleges but includes private and public institutions. If you create an account, the website allows you to apply to colleges and manage your high school transcript. Registered users can also take a variety of assessments such as an interest profiler and career cluster survey. The financial portfolio section also includes information on the scholarship application process. The site also has a variety of financial literacy tools and videos. The College Redirection feature allows students who haven’t been admitted for the fall to be submitted to a pool of students for North Carolina colleges with open admission slots. Users can also download a schedule of financial aid workshops offered by CFNC. Students interested in the Transferred Assured Admissions Policy also need to register at the CFNC website. Information on transferring from community colleges to private institutions can be found on the North Carolina Independent Colleges and Universities website (NCICU). Students interested in private colleges should download the NCICU Counselors Handbook that has information on private North Carolina colleges and universities. Students interested in online opportunities should visit the elearningNC website. The website contains information on online programs for high school, community college, and four-year institutions. There are 50 four-year North Carolina colleges with 500 or more full-time undergraduates according to the Integrated Post-secondary Education Data System. Approximately 29 percent of students attend one of the 35 private North Carolina colleges while a little more than 71 percent of students attend one of the 16 state institutions. The private colleges have an average four-year graduation rate of 40.8 percent while the four-year state schools have a five-year rate of 50 percent. 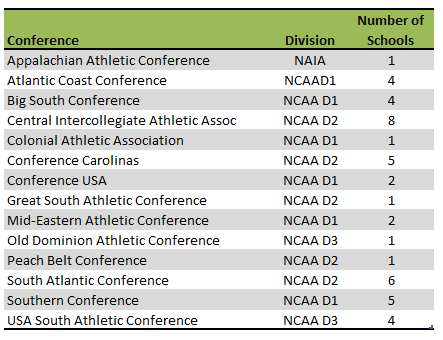 Eleven North Carolina colleges meet the 50-50 DIY College Rankings Profile Requirements. College-bound seniors in North Carolina had an average of ACT composite score of 18.9, 17.5 for English, and 19.6 for Math. The 75th Percentile scores were 22 for Composite, 22 for English, and 23 for Math. A total of 30 North Carolina colleges had 75th percentile scores at or above the state Composite of 22.